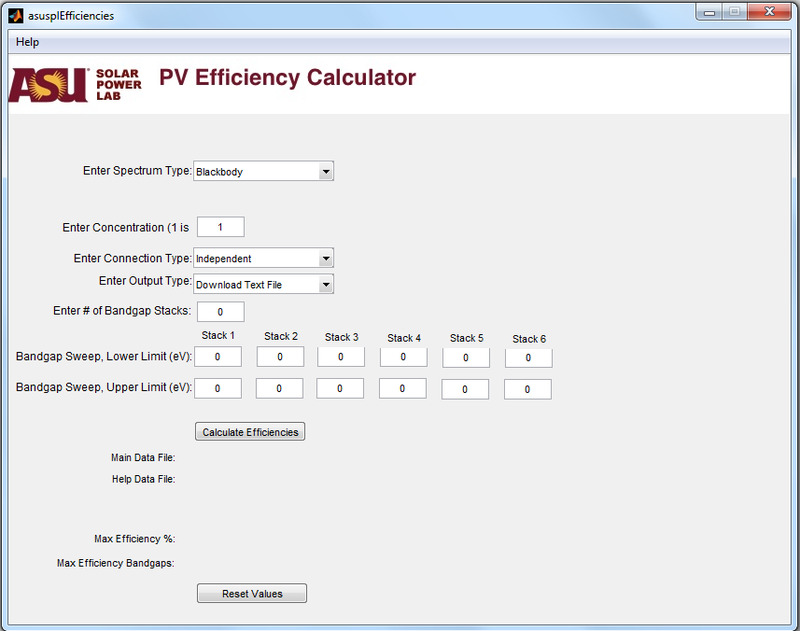 TandemCalc is a Windows-standalone application for calculating maximum efficiency of tandem solar cells. The application was developed with MatLab as the code base and requires installation of a 'MatLab Compiler Runtime' to operate. The MCR installation file is part of the downloadable package. To run the application, after installing the MCR (which you should be taken through automatically when executing the package file), run the TandemCalcv1.exe program. - Spectrum Type (dropdown box). The options are Blackbody and 'AM 1.5'. When selecting 'AM 1.5', if 'Concentration' is 1 then AM1.5G is used, otherwise AM1.5D is used. - Connection Type (dropdown box). The options are Independent and Series. - Output Type. Currently hard-coded to download a text file (and display results on screen). - Enter # of Bandgap Stacks: box that requires integer entry. - Six columns of boxes for bandgap sweep by stack. Enter the bandgap sweeps in order from lowest bandgaps (Stack # 1) to highest bandgap (Stack # n, where n=the value entered under 'Enter # of Bandgap Stacks'). After entering your parameters, click 'Calculate Efficiencies'. You will then see a progress bar that includes an estimate of how much time is remaining for this calculation. When calculating for Independent, you may see a sequence of progress bars and the last progress bar may show a bogus % complete above 100%, however, when that happens the program is nearly complete. When the program is complete, you should see values under the fields at the bottom of the window. Main Data File (data file that includes the efficiency % for each unique bandgap set calculated). Help Data File (data file that includes the parameters you entered along with the max efficiency % and max efficiency bandgaps). Max Efficiency % (maximum % efficiency based on the parameters you entered). Max Efficiency Bandgaps (bandgaps related to the maximum-calculated efficiency %). Please keep in mind that this software should be considered beta release and thus it is possible that despite the functional testing performed heretofore, you may enter parameters that result in an error I did not see/resolve. When this occurs, please log basic information related to the error at the following shared Google Doc in the 'Defects' tab. Also if you have suggestions on how to improve this software application, please log it at the following shared Google Doc in the 'Enhancements' tab.